In 2011 when only a few months earlier a hoard of over 90 coins and hacksilver was discovered in Barrow-in-Furness, Cumbria, a second discovery of a Viking silver hoard was unearthed in Silverdale, Lancashire. Ian Richardson talks about what happened when the two Viking silver hoards were discovered.. The saying goes that one waits an eternity for a London bus to arrive, only for two to eventually show up at the same time. Dot Boughton, Finds Liaison Officer (FLO) for Lancashire and Cumbria, is probably beginning to feel that the same rule applies to Viking silver hoards. It was only in April of this year that a hoard of over 90 coins and hacksilver from Barrow-in-Furness, Cumbria was reported to Dot. For any FLO, and indeed for the British Museum, which provides expert advice to enable the coroner to hold an inquest into the case (as required under the Treasure Act 1996), this represented a lot of material to work on. Not since the discovery of the Vale of York hoard almost five years ago had so many Viking-age artefacts and coins from one find been reported as Treasure. But no sooner had the coroner concluded his inquest into the Barrow case than Dot was on the phone to our office again with news of an even larger hoard. When the finder’s photographs were sent through to us, we knew this new hoard from Silverdale in Lancashire, was going to be one of the major enterprises of the year for us and our colleagues. Silver arm-rings, brooch fragments, ingots and coins had all (bar one coin) been found in, or underneath, a lead container. Barry Ager (Department of Prehistory and Europe) and Dr Gareth Williams (Department of Coins and Medals), were duly warned of the arrival of this material and they cleared their schedules. After a furious few months spent weighing, analyzing, cataloguing and photographing the finds, the report for the coroner was ready. 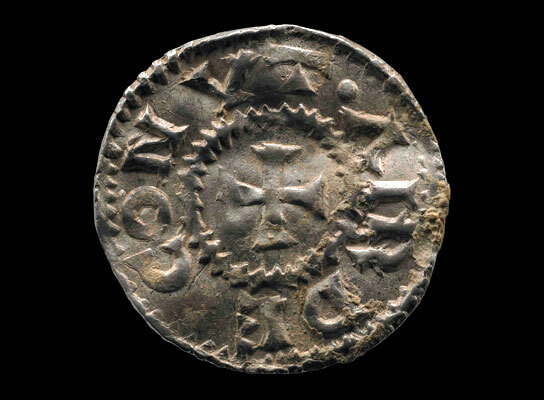 Among the many stand-out objects is a coin type none of us had seen before. One side of it reads DNS (Dominus) REX, the letters arranged in the form of a cross (many Vikings had converted to Christianity within a generation of settling in Britain). On the other side, the inscription reads AIRDECONUT which appears to be an attempt to represent the Scandinavian name Harthacnut, a ruler not previously known. The local museum, Lancaster City Museum, had earlier been informed of the find and as they expressed an interest in acquiring the hoard through the Treasure process, Mr Simon Jones, HM Deputy Coroner for Preston and West Lancashire has been asked to hold an inquest into the case. The inquest will be held on Friday the 16 December 2011, and we will find out whether it is ‘Treasure’ according to the criteria set out in the Treasure Act 1996. The finder and his wife obligingly accepted our invitation to attend the launch of the Portable Antiquities Scheme (PAS) and Treasure Act Annual Reports, held at the British Museum today where they have been able to join us in showing the hoard to Ed Vaizey, Minister for Culture, Communications and Creative Industries. Going forward, it is of course our sincere hope that Lancaster City Museum will be able to acquire the Silverdale hoard for its collection. If the coroner declares it ‘Treasure’, the next step is to have it valued by the independent Treasure Valuation Committee (TVC) who would recommend a market value for the hoard. The museum may very well engage in a fundraising campaign to acquire the hoard, and if they do so we’ll offer our full support. A selection of objects and coins from the Silverdale Hoard will be on display at the British Museum in Room 2, from Thursday 15 December through the New Year.